Smead is a document management company - one of the big names in filing products. The company is very proud of its new web site - and with good reason. I really liked this presentation of all their products. I like a particular kind of file folder, and it was easy to find it. 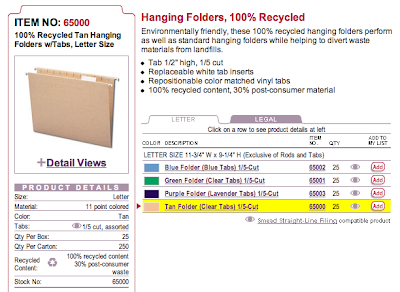 I also like that the company highlights the recycled content of all the products, and has some like these hanging folders, made from 100% recycled content and 30% post-consumer waste - in a variety of colors, no less. Smead is also proud of its new advanced search, which didn't impress me when I first tried it - it didn't find my file folders! - but seems to be working better now. 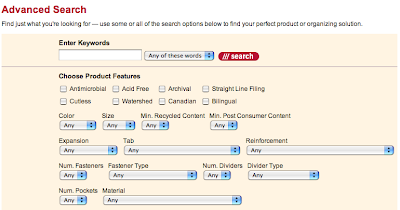 As an individual, you can't buy directly from Smead, but this site lets you know what's available (and the part numbers) so you can order them from your favorite store. They'll help you find a store, too. 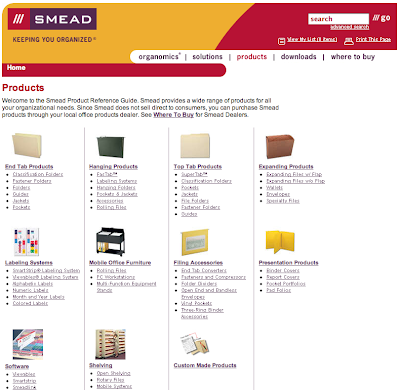 And of course many on-line sites sell Smead's products. Bigger Than Which Bread Box?